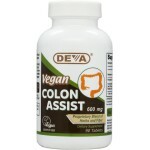 Very few herbs have been as extensively researched as Ginkgo Biloba. 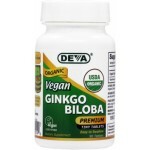 Deva Vegan Ginkgo Biloba is certified USDA Organic by ICS. 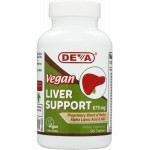 Each round tablet measures only 3/8" in diameter making it easier to swallow. 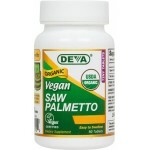 Saw Palmetto Berries have been an important part of men's health in many cultures for centuries. In the recent years Turmeric and its phyto-nutrients have been extensively researched and as a result Turmeric as a spice and Turmeric supplements have become very popular. 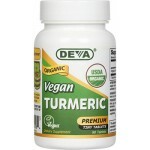 Deva Vegan Turmeric is certified USDA Organic by ICS. Each round tablet measures only 3/8" in diameter making it easier to swallow. 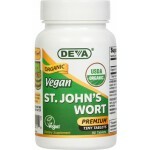 May help promote relaxation and a restful sleep for some*. Deva Vegan Valerian is certified USDA Organic by ICS. Each round tablet measures only 3/8" in diameter making it easier to swallow.